In the last few weeks, Catholics have been very forcibly reminded of the serious problems of doctrinal and moral corruption that run rampant in the Church. I do not intend to address these issues here, since this is not the purpose of NLM, and they are being addressed quite amply elsewhere. However, today is the feast of a Saint whose life provides us with a good example of what to do when the Church is in dark times. The Vision of St Cajetan, by Michelangelo Buonocore, 1733. While praying in the Chapel of the Crib at Santa Maria Maggiore in Rome on Christmas Eve, the Saint beheld the Virgin Mary, who then passed the Baby Jesus to him to hold; he is frequently represented this way in art. 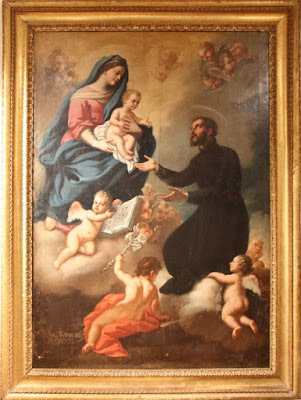 St Cajetan was one of the founders of the Clerks Regular of the Divine Providence, the very first order of Clerks Regular. They are usually referred to as the Theatines, since one of the other founders, Gian Pietro Caraffa, was bishop of the city of Chieti, “Theate” in Latin, in the Abruzzo region; he would later be elected Pope with the name Paul IV (1555-59). Cajetan himself was born to a noble family of Vicenza in the Venetian Republic, but spent much of his life in Rome. After studying theology and both civil and canon law, he came to the capital of Christendom in 1506, convinced that he was called to do some great work there. He was ordained a priest in 1516, and was actively involved in the foundation or revival of several small confraternities, both in Rome itself and northern Italy, through which zealous and devout Christians, clergy and laity, were able to keep the true spirit of their faith alive. To elaborate on this solely in reference to Rome: St Cajetan was ordained in the reign of Pope Leo X. Bad historians, who abound in every age, have in some respects unfairly tarnished the reputation of the two Medici Popes of the early 16th century, Leo (1513-21) and his cousin Clement VII (1523-34), along with that of their entire family. Nevertheless, Leo presided over one of great abject failures among the ecumenical councils, Lateran V (1512-17), which was called in part to deal with serious abuses that had become almost omnipresent in the Church, and did absolutely nothing to correct them. (The agenda of the Council of Trent is to no small degree that of Lateran V, done properly.) The failure of Lateran V did much to encourage the Protestant revolt, which could credibly point to the two highest authorities in the Church, the Pope and the ecumenical council, as evidence that things had gone badly wrong within it. Clement VII would then steer Rome into one of its greatest political catastrophes, the infamous Sack of 1527. 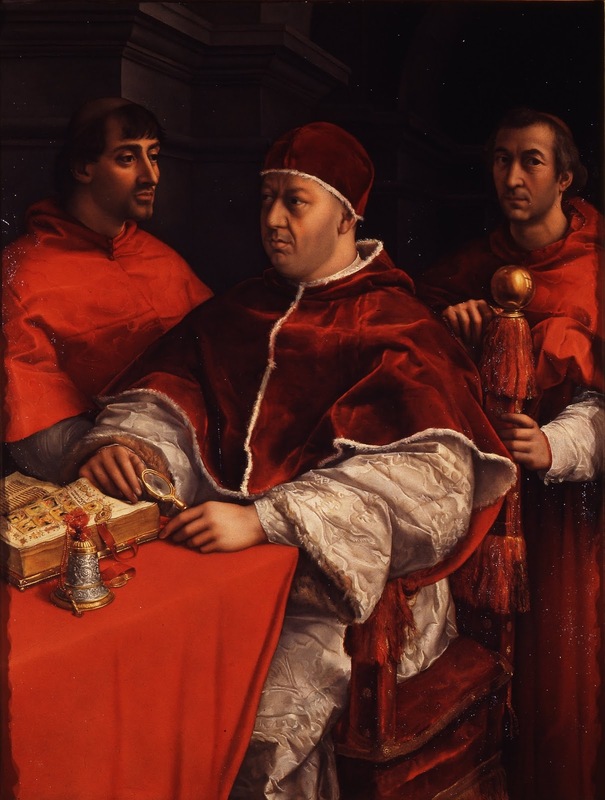 Pope Leo X, with Cardinals Giulio de’ Medici (left), the future Clement VII, and Luigi de’ Rossi, painted by Raphael in 1518-19. Among those who participated in the conclaves that elected them was one Alessandro Farnese; his sister Giulia was the mistress of the infamous Pope Alexander VI Borgia, who made him a cardinal in 1493. In accordance with one of the common abuses that Lateran V notoriously failed to correct, Cardinal Farnese held several incompatible benefices at the same time, in order to draw the revenues attached to them. He was simultaneously first a Cardinal-Deacon, then a Cardinal-Bishop, while also administrator of a see in France, archpriest of the Lateran basilica in Rome, and bishop of Parma, holding the latter two positions until his election as Pope in 1534. In the early years of his episcopacy, he fathered five children. Butler’s Lives goes on to say, “The spectacle shocked and distressed Cajetan, and in 1523 he went back to Rome to confer with his friends … They agreed that little could be done otherwise than by reviving in the clergy the spirit and zeal of those holy pastors who first planted the faith; and to put them in mind what this spirit ought to be, and what it obliges them to, a plan was formed for instituting an order of regular clergy upon the model of lives of the Apostles.” The name “Clerks Regular of the Divine Providence” refers to the fact that, in imitation of the poverty of the Apostles, whose spirit they hoped to revive in the Church, they neither begged like the mendicants, nor accepted permanent endowments like the monks, but lived on whatever might be offered to them spontaneously by the faithful. At the time of the Sack of Rome, the Theatines numbered only twelve members; their Roman house was almost destroyed in the sack, and Cajetan himself was cruelly treated by soldiers who hoped to extort money from him, assuming (as well they might) that a cleric in Rome must be rather wealthy. The community was forced to flee to Venice. After serving for a time as superior, Cajetan was sent to Verona, where he and his confreres worked in support of a reform-minded bishop against the fierce opposition of both the clergy and laity. He then went to Naples, where he spent the rest of his life, and where the reforming principles promoted by his order bore greater and longer-lasting fruit. The Breviary lessons for his feast day note that “more than once he detected and put to flight the evils and subterfuges of heresies.” This refers to his successful opposition in Naples to three heretics (two of them apostate friars) who had been corrupting the faith of the people. The high altar of San Paolo Maggiore, the Theatine church of Naples. The order did not unlearn the important lesson imparted to the Church by earlier Orders like the Cistercians and Franciscans, that the poverty of religious is not practiced by impoverishing the house of God. The altar of the crypt, containing the Saint’s relics. What would a man like Cajetan have thought when a man with a past like that of Alessandro Farnese was elected Pope in 1534, taking the name Paul III? What would he have thought of the fact that within a month of his election, the new Pope had appointed his 14-year-old grandson, also called Alessandro, as his own successor in the see of Parma, raising him to the cardinalate shortly thereafter? Was he perhaps tempted to despair on learning that another papal grandson, Guido, was raised to the cardinalate alongside his cousin? Or did he sigh with relief, thinking that Guido, at the ripe age of 16, was at least more experienced in ecclesiastical affairs, since he had been a bishop since shortly before his tenth birthday? And yet, almost from the moment of his ascent to the Chair of Peter, Paul III showed himself the first Pope to actively and effectively work to oppose the Reformation, not only as a challenge to the Faith, but as a problem of internal reform. 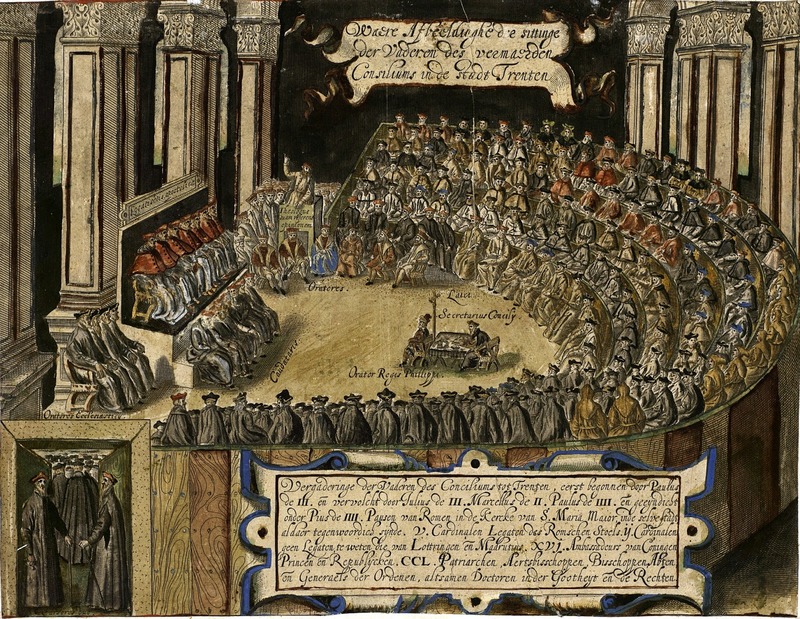 In 1540, he formally recognized the Society of Jesus, the shock troops of the Counter-Reformation, and despite political difficulties of every sort imaginable, began the Council of Trent in 1545. Among the many cardinals he made in his twelve consistories is numbered yet another of his grandsons, but also Gian Pietro Carafa, who was as ardent a reformer as Pope as he had been as a religious priest and then bishop, and a good many other worthy men. One of his two English cardinals, St John Fisher, died as a martyr for his opposition to England’s new pastoral approach to adultery. The other, Reginald Pole, was for the same reason very nearly murdered in a park outside Rome by men in the pay of his kinsman, King Henry VIII. St Cajetan’s ministry in Rome, and that of his order, was certainly important, but never very large, and would be overshadowed by that of his near contemporary St Ignatius, the founder of what would become a vastly larger and more widespread order of Clerks Regular, and by St Philip Neri and the Oratory in the following generation. He belonged to the generation of good men who suffered through evil days, trusting that the evils they deplored, but could oppose only partially or not at all, would come to an end in God’s time and by His grace. Though they knew not the day nor the hour, their good example laid the groundwork for the sweeping and highly effective reforms of the Counter-Reformation. Therefore, if the corruption and heresy we read about from the days of St Cajetan seem depressingly familiar, let us take encouragement from his example. Let us each do what we can so that future generations remember the Catholics of these days as those who laid the groundwork for the next Catholic Reformation.